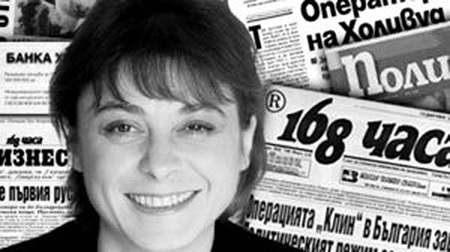 Radostina Konstantinova Foundation was established on May 11, 2011 her date of birth – by friends, relatives and co-workers of Radostina Konstantinova, a founding member of 168 Hours Pressgroup and the popular papers „168 Hours“, „24 Hours“, „Monitor“ и „Politika“. The main goal of the Foundation is to encourage objective investigative journalism in Bulgaria, and support all colleagues, who have chosen this difficult genre. „Radostina Konstantinova Foundation” announces permanent Grant Program for investigative journalism. These grants will only cover the expences of the approved projects, without author`s fees. The submitted ideas will be evaluated upon the following criteria – objectivity, social importance, truthful facts. Please send your ideas and estimated expences to Zoya Dimitrova, Foundation`s consultant, at e-mail zoyadim@yahoo.com, GSM: 0889 714 389. There is no deadline, the program is open.